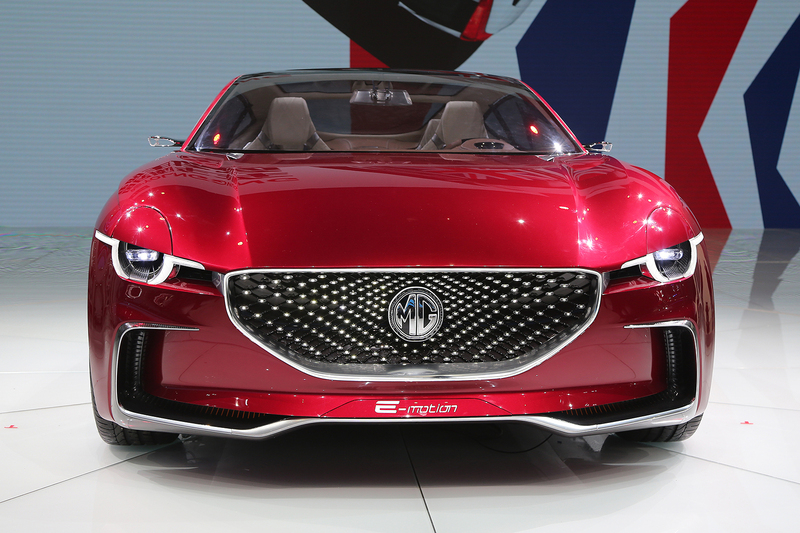 The MG E-Motion concept is on course to make production in 2020 as an electric sports car that could rival the Tesla Model S.
MG UK's sales and marketing boss Matthew Cheyne expects the E-Motion to make production around 2020, priced from less than £30,000. Following the release of images in the build up to the show, Cheyne said feedback had been good so the car was highly likely to get the green light. The E-Motion features eye-catching butterfly doors and has a four seat layout inside. It uses advanced connectivity systems and touchscreen infotainment for both the front and rear passengers. Using an all-electric powertrain that has been developed in house, the concept is claimed to be capable of 0-62mph in less than 4.0sec. It has a range of over 310 miles. The E-Motion shares the same front styling treatment as MG's upcoming ZS small SUV, but appears almost Aston Martin-like in profile, with vertical taillights and an uncluttered rear design. The E-Motion's front grille appears to take inspiration from Mercedes-Benz’ ‘Diamond’ grille, with patterns of dots in place of traditional mesh, while the front of the car isn’t dissimilar to Mazda’s design language. A motif incorporated into the headlight cluster appears to mimic the MG Icon concept of 2012, though, which in turn paid tribute to the MG B. A sports car is a far cry from the mass-market friendly MG GS SUV and MG 3 supermini currently on sale from MG, which is a SAIC-owned company, but brand spokesman emphasised that MG's market was ready for such a product. It would be the first all-electric MG model to be produced since the EV concept of 2014. Speaking at MG's Shanghai research and development centre, the brand's product planning boss Zhang Liang said MG would put the car into production if reactions to its reveal at the Shanghai motor show are positive. Yes it's another concept, but it is heading broadly in the right direction. 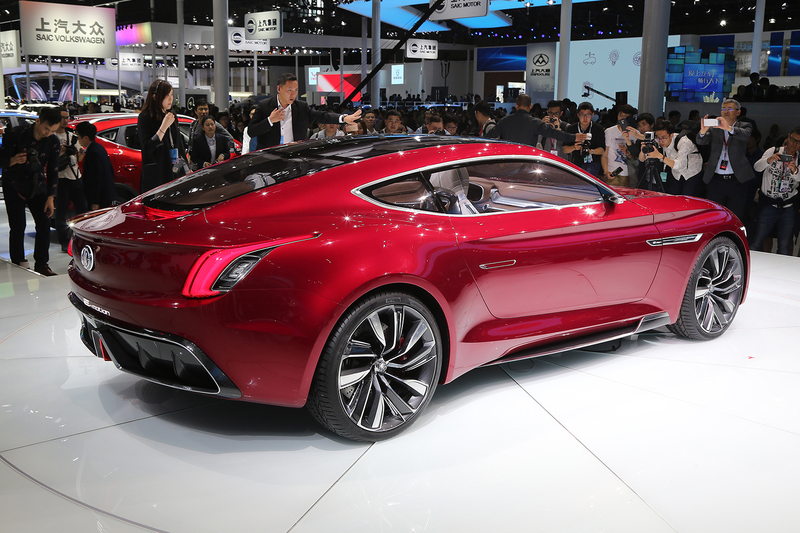 Yet another MG Concept that will bear no resemblance to any future car. Such a shame after previous promising concepts that led to the MG5 and the MG3, and the MG Icon that seems to be heading to the oh so boring MG ZS, or whatever it is going to be called. Well their recent output is most politely described as "motion"
Let's hope this isn't the same stuff just polished and covered in glitter. Aston not gonna be happy. First Bentley now MG, next up its probably Range Rover lmfao. mind you current Aston design came around from a Jag concept so maybe it's what goes around comes around. I had given up on MG, but this is interesting - IF they produced this and the quality was good, with a realistic plus 250 mile range, a £35k price tag etc. then I could see this potentially as a new beginning for the brand and crucially something I would want to get behind the wheel of. I can imagine a closely styled saloon spin off and a Stelvio like electric SUV, followed by smaller and larger versions. I can hope for this anyway! MG is definitely on the start of something new. Apparently the MG "E-Motion" can do 300 miles on a charge and reportedly can do 0-60 in around 4 seconds, we have the new MG ZS SUV on the way incorporating the new family face seen on the "E-Motion", a brand new MG 3 in the works and possibly an facelifted GS to adhere to the new family face. It is reported the new Roewe 550L will become the new MG 6 and Roewe also have the Vision R concept and RX-5 (Based on the GS). There is new engines also, the first of which was seen in the GS and were developed with General Motors. Unfortunately thats not the case these days with Chinese build improving rapidly. Just check out the MG GS.whilst the styling may not appeal the build quality really is surprisingly good indeed. In fact as of now BMW,Audi,VW and Mercedes all have manufacturing plants in China. Not saying MGs is the best...not at all but its now certainly on a par with the likes of Hyundai and Kia. "MG looks to return to its sports car roots with the E-Motion"? I don't think so MG, as a brand owned by Shanghai Automobile Industry Corporation (SAIC), has no roots in the British motor industry, whatsoever.